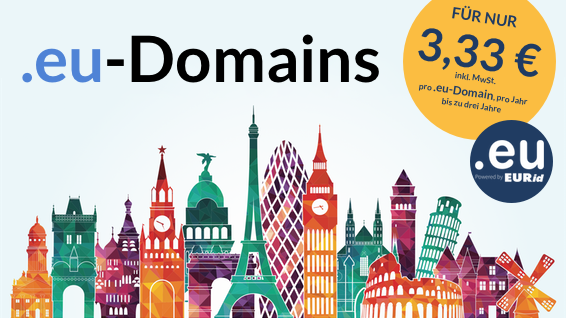 Until November 30th you can register 1,2 or 3 years of .EU domains for only €3.33 per domain year. Is your country TLD (.de, .be, .nl, .at…) already taken? Do you own a business that operates across all of Europe? Why not go with a .EU domain for over 50 countries at once? Check out our .EU landingpage for more information or search directly for your new .EU domainname. To save even more, you can now bundle a .com with a .eu domain. If you put both mydomain.com and mydomain.eu into your cart, a coupon is automatically applied to give you an additional discount for both. Promo prices only valid until November 30th 2018. Net prices: 2.80 € in the first 3 years, 6.45 € afterwards. Previous: Previous post: How to choose the right domain extension for your business?